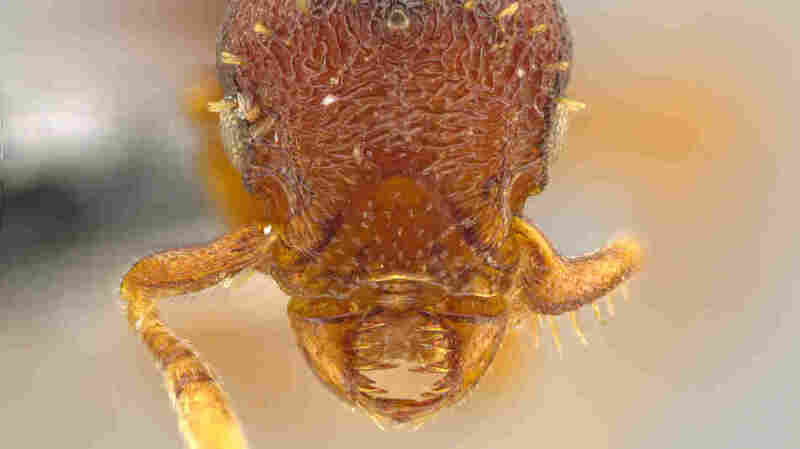 Jack Longino, 'The Astonishing Ant Man,' Finds 33 New Species All told, the scientist has discovered 131 new species of animals in his career, and some are so scary-looking, he's named them after demons. It's a task that's taken more than 30 years of crawling through rain forests to accomplish, and Longino says he's still only scratched the surface. While many of us spend our working days staring into an electronic box or dozing at meetings, there are some who prefer to crawl through tropical rain forests. People like "the astonishing ant man." That's what his students call Jack Longino. Longino started out collecting stamps in his childhood, but that got boring fast. Man-made things just didn't thrill, so Longino decided to "get small." As in: "If you're shopping for a home entertainment system," he says, "you can't do better than a good dissecting microscope." In school, Longino put insects under the microscope, and voila! A new world emerged. "With insects, I kept finding things I could never have imagined," he said. Like amazing jaws: "These strange sideways mandibles with all the teeth on them," he says, with wonder still in his now grown-up voice, "and these shield-like faces." They're scary, he says, "and they made me think of Hollywood monsters, the creature in Alien and Predator." 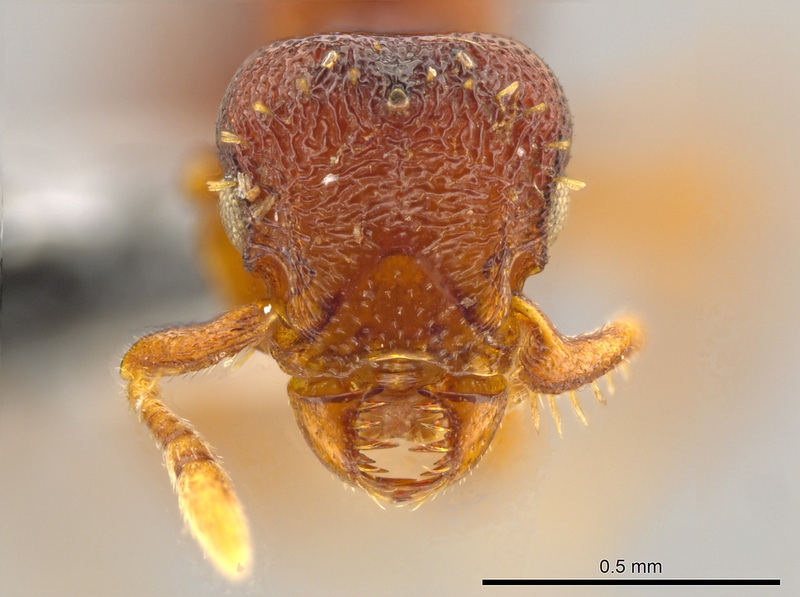 The face of ant species Eurhopalothrix semicapillum, named for the hairy patches on its face. When he grew up, Longino started hunting these monsters on his hands and knees in Central American rain forests. He found that the hardest part was just getting there. "You know, when the truck is starting to slide backwards in the mud towards the cliff edge, those are scary moments," he recalls. Once there, he did what entomologists do: whack the leaf litter on the ground with a machete, then shake it through mesh screens into bags. Scientists call it, not surprisingly, "sifting." You end up with bags of what looks like potting soil. "You don't see much when you look at it," Longino says of the so-called "Winkler bags," "but actually when you look close, there's a high concentration of little crawling things, and that's the gold." 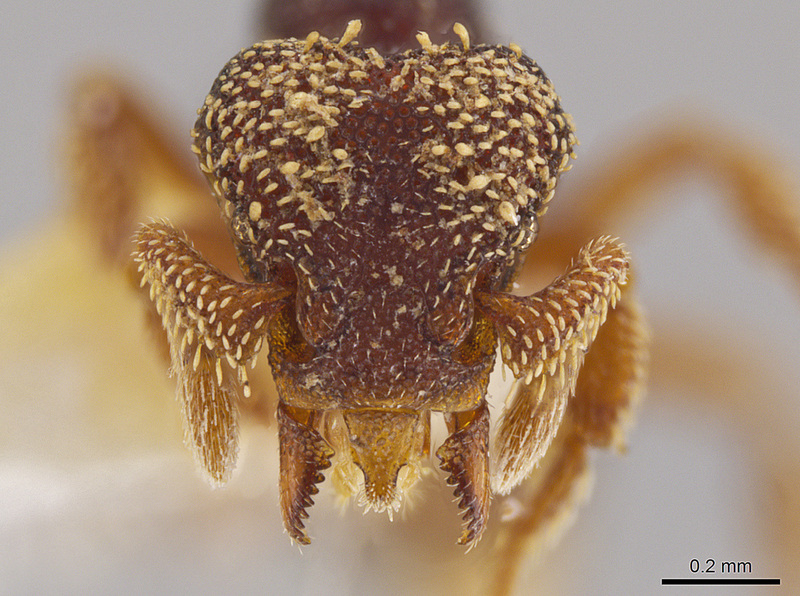 Note the sideways-moving jaws on the face of this queen of the ant species Octostruma convallis. The ants eventually escape out the bottom and into a container full of alcohol. "It is hard work," Longino assures, "but you do have the sitting-around-drinking-beer phase." But that's a brief phase if you want to discover new species, and Longino is pretty good at that. 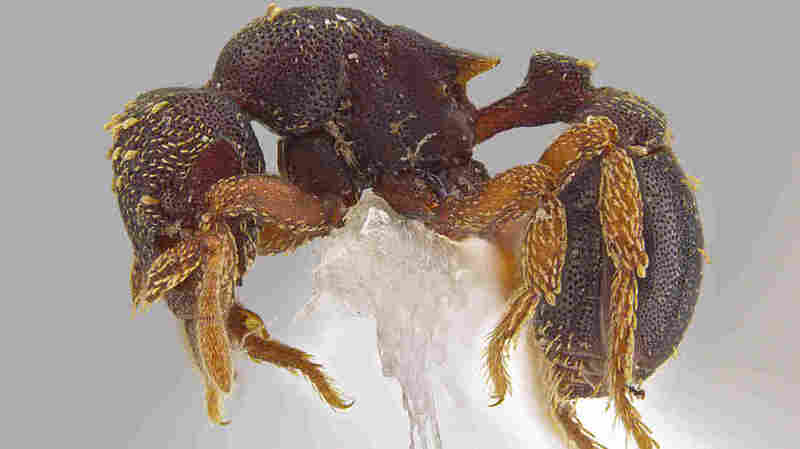 He's just published two papers describing 33 new species of ants, bringing his personal "new species" total to 131. Longino says that's actually average among entomologists. "I do OK," he says, noting that some scientists have discovered thousands. 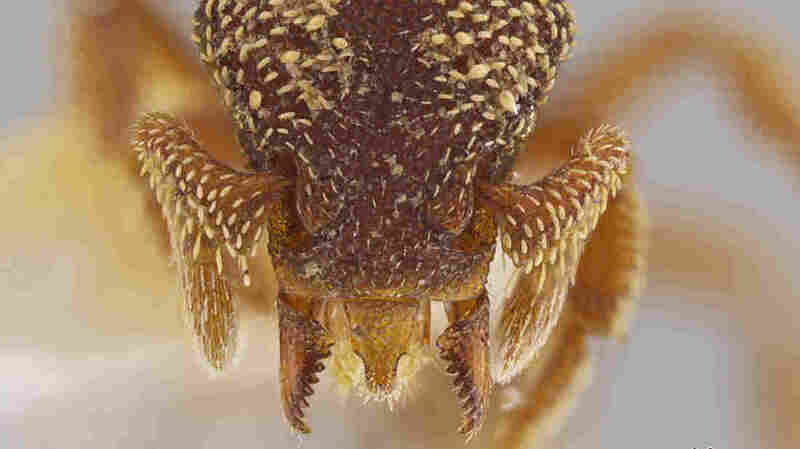 But naming the newly discovered bugs is where you can really have fun. Longino recalls his graduate student — a self-described "metal head" — encouraging him to be creative.
" 'Jack, Jack, you oughta name these things, like, after demons,' " the student exhorted. "So Zipacna was one of these Mayan lords of the underworld, and there was this word in the dictionary that was Mabuya, that was a demon, and so I named one Eurhopalothrix mabuya, which I think just sounds great." Taxonomic poetry aside, Longino says he's deeply serious about describing all the new species he can; these are snapshots of a disappearing world. "It's hard to attach enormous importance to any one little ant species," he says, "but you know, I always feel like our descendants — they're going to be upset with us for wrecking the planet anyway — but they're really going to be mad that we didn't even bother to take a good picture." When he's not sticking his head in a dead tree in the rain forest, Jack Longino is a biology professor at the University of Utah. You're a student. You study with an entomologist. You sign up for an exciting trip to the rain forest, and this is what you do all day: Sift for ants!